HOLDEN -- Depending on which side of the fence you happen to be on, everyone has an opinion regarding the MIAA state high school football playoff system. Good, bad or indifferent, the new format, which began in 2013, has received its fair share of praise and criticism. Among the latter is a lack of significance now being placed on Thanksgiving rivalry games. By the time these contests are played, the state championship schedule has already been set. For those teams fortunate enough to earn a trip to Gillette Stadium, some of them have had a history of limiting playing time for their starters during Thanksgiving contests in an effort to avoid any possible injuries leading up to the title game. Under the old format, there were many occasions throughout the years when a particular Thanksgiving outcome would determine a team’s chances of securing a regional Super Bowl berth. With that now gone, a majority of these rivalries have proven somewhat inconsequential. There was one particular encounter with something still at stake. 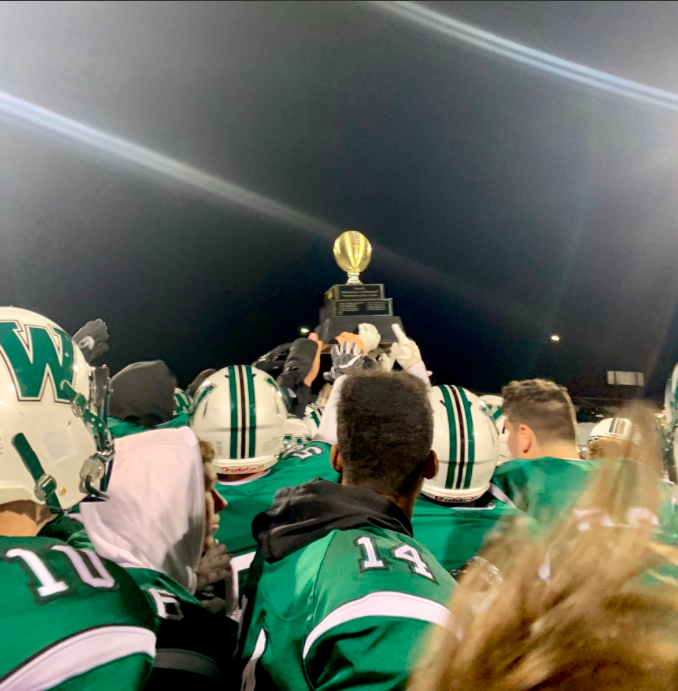 Playing on a frozen, snow-covered turf, three rushing touchdowns by running back Gavin Maenzo, and a late Mountaineers defensive stop, proved to be the difference as Wachusett prevailed 21-20 over Shrewsbury at Hal Lane Field to claim it first Mid-Wach A crown since 2012. "We have been working hard all week for this," said Maenzo, a senior. "It's a brotherhood here and we all have each other's backs. It feels really good to win the league title. I feel like we definitely deserve it because we have a great team. All of our hard work throughout the season finally paid off for us." Leading by seven points with less than three minutes remaining, Shrewsbury senior Alex Cashman returned a punt 47 yards. A pair of Wachusett penalties during the return moved the ball to the 11 yard line. Needing just two plays, Colonials quarterback Drew Campanale scored from 7 yards out with 1:06 remaining to make it a 21-20 game. Opting to go for two, Campanale’s ensuing run fell just inches shy of the goal line thanks to a strong Mountaineers defensive front, spearheaded by junior Jacob Nadeau. On its ensuing drive, Wachusett (8-3, 4-0) was able to run out the clock. "It was a great play all around to stop them," Nadeau said. "We feel by winning the division title it represents the whole Wachusett program very well. Thanksgiving football is a tradition here. Everyone loves to play on Thanksgiving here no matter if we aren't in the playoffs anymore. This still feels like a playoff game and a championship to us." Following a quick first half, both teams continued to play a game of cat-and-mouse for much of the final 22 minutes. Shrewsbury (7-4, 3-1) went into the break clinging to a 7-6 lead. Early in the third, Wachusett had a chance to take the lead but a field goal attempt was blocked by Ryan Turner. Later in the frame, the Mountaineers offense was back at it. Marching 59 yards, senior running back Gavin Maenzo bolted around the right end 15 yards put Wachusett on top 13-7 with 18 seconds remaining in the third. But the Colonials answered the bell on their next series. A 56-yard scamper by Campanale (12 carries, 93 yards) set up Cashman’s 2 yard plunge over the goal line that gave the lead back to Shrewsbury 14-13 with 9:43 left to go. Despite the blustery, cold temperatures, the offensive numbers by both teams remained relatively even. The Mountaineers finished with 206 yards while Shrewsbury produced 199. "This was a game of momentum that swung both ways for both teams," said Wachusett coach Mike Dubzinski. "All of our kids played really well tonight. This is what Thanksgiving games should be like. This game meant something to Shrewsbury and it meant something for our kids as well." Following Cashman’s score, the Colonials defense forced Wachusett into a quick four-and-out. However, TJ Morgera fumbled a punt that was recovered by junior Doug Cain, giving the ball back to the Mountaineers and setting the stage for their game-winning drive. Starting from its own 47, Wachusett stuck to its ground game throughout the possession. A 14-yard jaunt by J’Zhon Henderson was immediately followed up by a 9 yard carry from senior back Sam Brewer (81 yards on 18 attempts) that moved the ball to the 3 yard line. A hand off to Maenzo up the gut put the Mountaineers ahead to stay with 6:13 remaining.